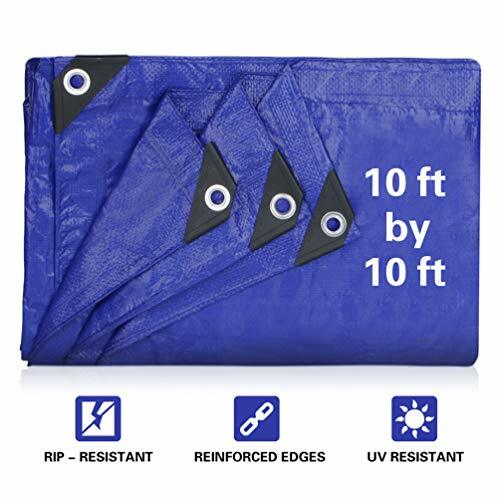 JTW Product Waterproof Tarp made from a tight polyethylene weave which provides super durability and flexible solution to all of your covering needs. 95gms：Used to cover wood, hay, swimming pool，ect. PRODUCT SIZE：The size of the tarpaulin is the size of the 10 'X 10' finished product. PRODUCT EFFECT:This tarpaulin can fully prevent and control the shelters, shrink, waterproof, prevent ultraviolet rays, prevent decay, can shield heavy goods, prevent rusting, prevent moldy and so on. PRODUCT MATERIAL:The main ingredient is the polyethylene tarpaulin. The surface is 95 Gsm. DETAIL PROCESSING:Product is 10*10 weave technology. Aluminium Grommets Spaced 36 inches apart, 2.3cm diameter，Reinforced Corners.Industrial capped double reinforced corners. STRENGTHENING QUALITY:The tarpaulin is thickened and the thickness is 5 mil thick.More difficult to tear. It can withstand some harsh environment and bring certain protection. If you have any questions about this product by JTW Product, contact us by completing and submitting the form below. If you are looking for a specif part number, please include it with your message.